I just got off the phone with Warwick and Eric, the company’s CEO and the company’s President, respectively. We went through the case study of the Fire Creek gold deposit, which was owned by Klondex, then acquired by gold giant, Hecla Mining, for $462M. 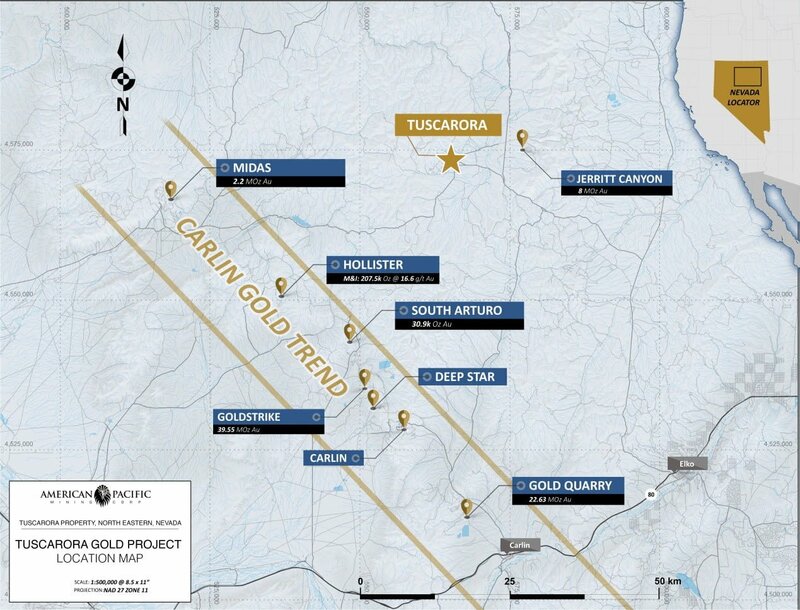 We talked about how it is extremely comparable to the Tuscarora asset, which is owned 100% by American Pacific Gold. Right now, the market cap of American Pacific Gold is a mere CAD$13.44M, even though this district was drilled over the years by previous owners (including Newcrest Mining) to the tune of about $20M. I’m buying a position because Eric Saderholm knows exactly how to bring assets into production and generate immense value for shareholders. He has been directly involved in the discoveries, development, and production of Lone Tree, Yanacocha, Carachugo, San Jose, Chaquicocha, Gold Quarry, Genesis, Leeville, and around 10 additional ones. You can count on one finger the number of better suited geologists in Nevada, as I see it. Consider Shares Of American Pacific Gold (CSE: USGD & US: USGDF) Now – The momentum Is So STRONG! Shares Are Up 700% This Year! Warwick and his family own 10% of the shares. Eric and his family have a similar-sized position. Collectively, these insiders control 20% of the company. You bet they want to unlock the full potential of this beast. Consider partnering with two of the greatest in the business now: American Pacific (CSE: USGD & US: USGDF). The price they paid for Tuscarora will go down in history as one of the best deals in gold mining in Nevada. It would never happen without Ken Cunningham, a director with the company. His deep connections in the industry have made this possible. He previously ran Miranda Gold successfully from $0.25 – $2.15; nearly a 900% move. Their neighboring properties in Nevada are some of the best assets in Nevada: Tuscarora is located 35km northeast of the Carlin trend; 20km southwest of the Jerritt Canyon deposit (owned by Jerritt Canyon Gold, a subsidiary of Sprott Mining); and 50 km northeast of Hecla Mining’s Midas deposit. This is gold mining mecca. We will own an asset that is in the heart of the most prolific region in the world and we get to do it now. The valuation is less than what previous owners have already sunk into it, and we already know there are 12 high-grade veins running through it. This is akin to buying a house for half of the building costs and materials; never mind the developer’s profit – it’s not even priced in. I am stunned that this situation is even out there for the taking, but as you can tell from their 700% rally in the past 90 days, there are definitely some very sophisticated investors – and they’re positioning NOW. Warwick is in charge of negotiating the deals, creating the JVs, and scouting for more deals. Eric is the most competent geologist to have on the team of any junior miner, in my eyes – I can only imagine how many companies wanted him on board when he left Newmont. Ken Cunningham has the relationships and the network to advance the asset along efficiently. Best of all, we know the GOLD is there and we know that this management team has created immense shareholder value in their previous ventures. This is my ticket for the bull market: Consider shares of American Pacific (US: USGDF) NOW! This work is based on SEC filings, current events, interviews, corporate press releases and what we’ve learned as financial journalists. It may contain errors and you shouldn’t make any investment decision based solely on what you read here. It’s your money and your responsibility. Wallace Hill Partners, a Canadian LTD, which is owned by the individuals that own Wealth Research Group, has entered three year marketing agreement with American Pacific Gold and has been compensated two hundred and fifty thousand dollars and has received two millions and eight hundred thousand shares directly by the company. The information herein is not intended to be personal legal or investment advice and may not be appropriate or applicable for all readers. If personal advice is needed, the services of a qualified legal, investment or tax professional should be sought. CRYPTO IS BETTER MONEY: Paul Rosenberg Proves that Bitcoin Beats Fiat! Middle-Class is DEAD: Let This SINK IN!